Heat oil in a kadai add the mustard seeds turmeric powder, red chili powder ,salt and mashed potatoes mix well , remove from heat set aside and cool. Grated cottage cheese, salt and black pepper in a bowl mix well keep aside. Now whisk the gram flour , chili powder, turmeric or salt with approximately 1-cup of water in a deep bowl to make a smooth batter set aside about 10 min. Divide the both mixture in eight equal portions, and remove pulp from the tomato and stuff tomato with potato mixture and top with paneer mixture. 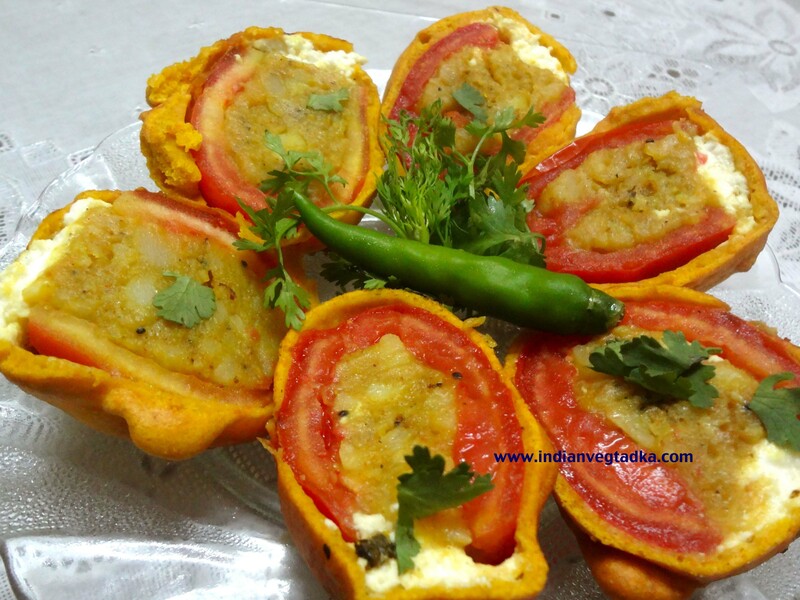 Heat sufficient oils in a kadai dip the stuffed tomato in the gram flour batter and deep fry till golden brown and crisp. Drain on absorbent paper and serve hot with green chutney. It’s really a cool and useful piece of info. I am happy that you just shared this helpful information with us. Please keep us up to date like this. Thanks for sharing. As they say, “haters gonna hate”. Thanks for the post.